Now every personnel and student's information in secondary education will be available in one click. Shala on the mirror portal moves get all the information from any school on one click. शाला दर्पण Shala Darpan Whether or not the teacher is appointed by the Department will be aware of how many teachers are in school or who have read children at the school. The secondary Education Department is now uploading photos of each personnel to the Shala mirror portal. The institution shall have to upload the principal to the photo portal of the working personnel at their school by June 30. Apart from the promotion and staffing pattern on the portal, teachers and personnel are also instructed to enter Sastha sheriffs by June 30. The results of the pupils will also be recorded on Potarl, in this order the results of the year 2015.16 examinations of the organization sheriffs have also been instructed to enter on the portal by June 30. In addition, 3 to the association. To update the information of personnel, the new institutions from promotions must also update the sheriffs and board codes. शाला दर्पण Shala Darpan In addition to the Secondary Education Council, the state project director Jassaram Chaudhary was asked to enter all accounts information, including the Student and Development Fund in the school development and management Samitie schools, directly in the directive to the institution. Is। So that the various funds and the amount available in the schools can also be viewed on-line. 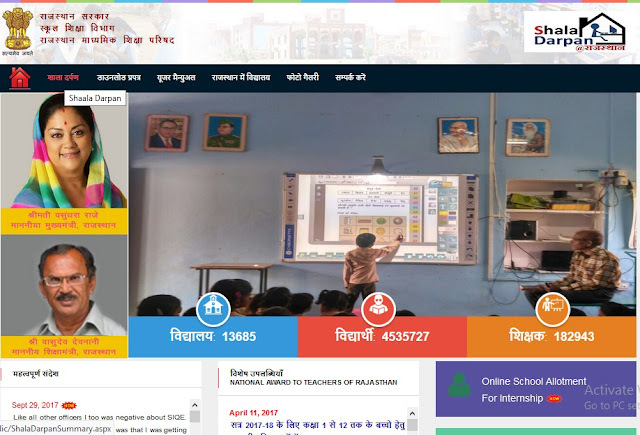 शाला दर्पण Shala Darpan The jvoining and relieving shala of personnel promoted in the secondary Education Department will be through the mirror portal. Director B. L. Svarnakar has issued instructions to secondary all district education officers in this regard. In fact, the work of jvoining and relieving from the Shala mirror is going on pending institution level. The director has punctualed the institution's principals, taking seriously any episode pending. शाला दर्पण Shala Darpan There will be a salary withdrawal of the May month after the feeding of personnel who joining on the promotion in form-3. In this regard, the Director has issued another command on all Koshadhikari and sub Koshadhikariyon. According to the personnel recorded in the May month salary withdrawal action Shala mirror form-3 A.